This is the last installment in a series of nine posts in which I transcribe the will of my Revolutionary War ancestor, Captain Thomas Hemphill. In the first post, we learned that Captain Thomas’ will was contested by two of his children and a son-in-law, and that the date usually seen for his death may be wrong. The copy of the contested will as it was transcribed into the court records began on page 2. Pages three and four continued the will copy and began to explain the reasons that the will was contested. Pages 5, 6, 7, and 8 continued the court testimony and page 9 wraps everything up 1 .
the Case Hemphill et al vs. Hemphill et al. Morganton the 4th May 1830. 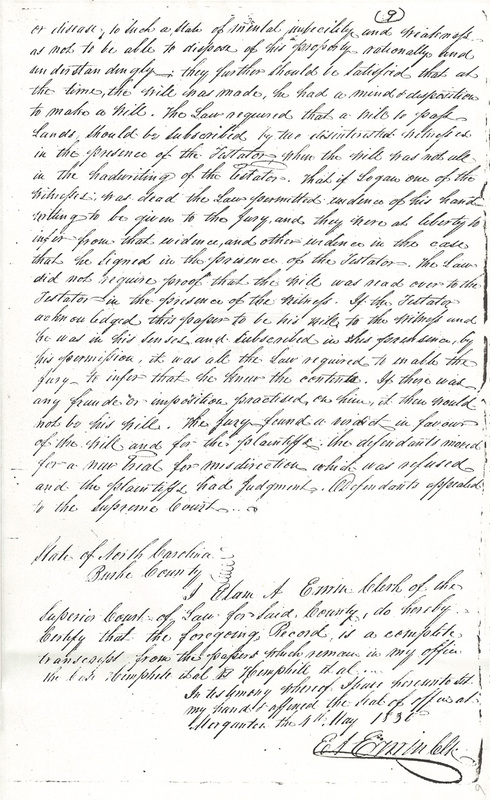 This page wraps up the court case in which some of Captain Thomas Hemphill’s descendants contested his will. 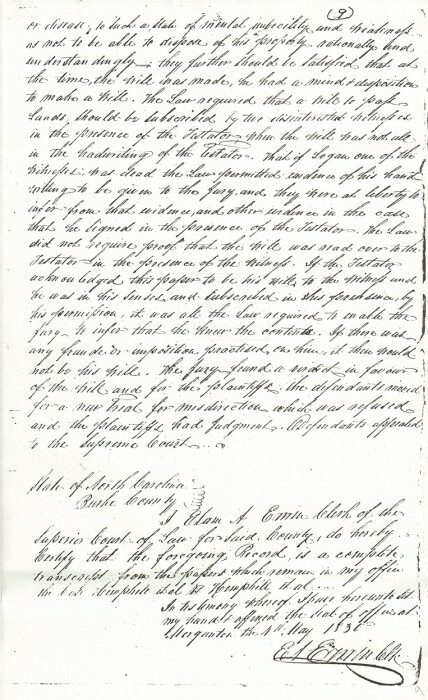 The plaintiffs prevailed and the will, as written, was declared to be the last will and testament of Thomas Hemphill. Having finally figured out how to subscribe to a feed (!!!!) just wanted you to know how interesting it has been to follow these transcriptions of the will, as well as the other information contained in you site! Thanks Susan! I’ve really enjoyed transcribing this will – it has been so interesting. By the way, I don’t know if you’ve looked at any of the 1940 census that came out this month, but I found your parents, living next door to Alice and my grandfather. Thank you Tonia for your dedication to this document. My husband is descended from the black slaves of the Forney, Greenlee, Hemphill, Henry, Whiteside and Carson families. It is an amazing story. This will is one of the few documents I have read that actually names slaves-a wonderful help. It has brought me as close as I have come to connecting Esther Hemphill to her slave master. God willing, I will make that connection soon. Thank you again! I have been working on my family history since 1986. I inherited the genealogy bug from my maternal grandmother, who inherited it from her father. Thankfully, through them, the majority of my maternal ancestry has been preserved. Documenting my paternal line has been very intensive. I am a direct descendant of Thomas Hemphill through his daughter, Martha, who married TYH McEntire. Their daughter, Rosanna (which I have seen spelled many ways), married Chisolm Daniel. From them, my line is Leonard Addison, Nathan Henry, Henry Gurley, Charles Edward, Bobby Leon and then me. I have enjoyed reading what you have found in your research.